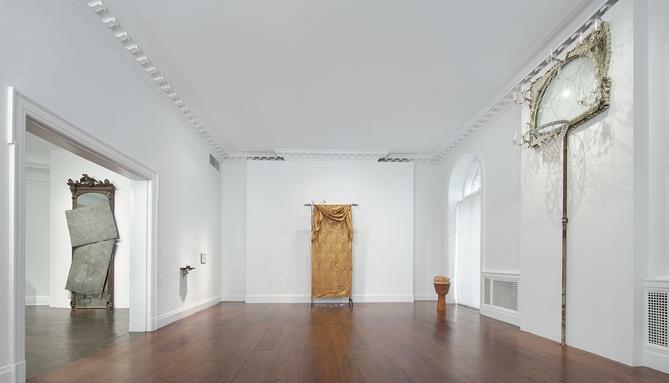 Mnuchin Gallery is proud to announce David Hammons: Five Decades, a career survey of David Hammons (b. 1943, Springfield, IL). On view from March 15 – May 27, 2016, this will be the first exhibition of its kind in twenty-five years. 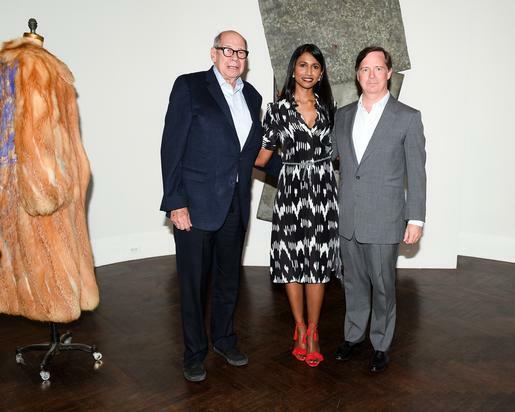 The show, organized with Hammons’ support, will trace the evolution of the artist’s entire oeuvre from the late 1960s to the present day and build on Mnuchin Gallery’s history of collaboration with the artist, following the gallery’s presentations of new work in 2007 and 2011. Conceived by the artist himself, the installation incorporates never-before-exhibited photographs from Hammons’ personal collection documenting key works and performances throughout his career. A testament to his work’s enduring engagement with music, the artist has filled the galleries with the sounds of the koto and shakuhachi of traditional Japanese court music. An opening reception will be held on Tuesday, March 15 from 5:30 to 7:30. 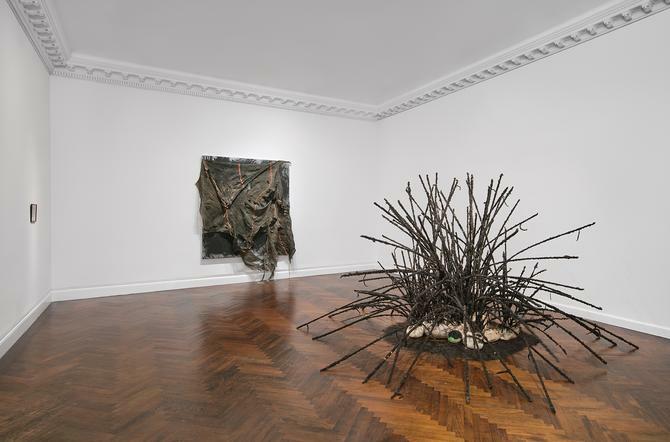 Grace Bonner, Jack Bankowsky and Claire Bishop select "David Hammons: Five Decades" at Mnuchin Gallery for their Top Ten of 2016. 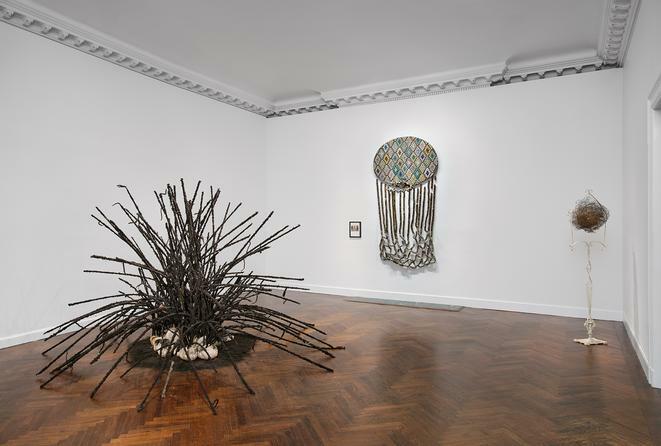 Over the decades, David Hammons's aesthetic originality has maintained relevance through his oblique use of materials and subtle manner of transmitting meaning through seemingly incongruous, yet fertile combinations of objet trouvés. There are many examples, ranging from rock and hair sculptures to vibrantly lyrical Kool-Aid paintings and his rugged use of black rubber, fabric, concrete, and steel, not to mention his snowballs and paintings concealed by tarpaulins. Hammons's remarkable assemblages invoke a sense of brilliant absurdity while manifesting an implicit awareness of African American urban street life. His body prints and assemblage works accurately reflect the human condition during a time of media transition between the late 20th and early 21st centuries. 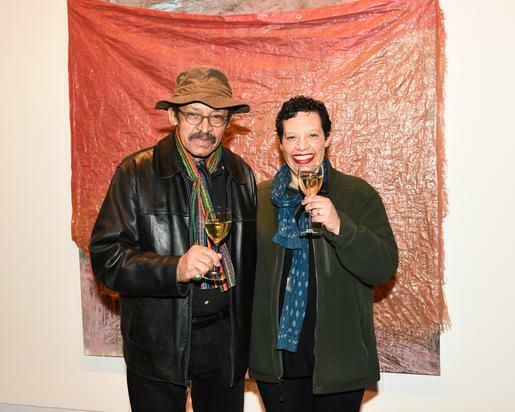 ﻿The most passionately discussed New York City gallery exhibition of last season might have been Philip Guston at Hauser & Wirth, but the most talked-about one by a living artist was undoubtedly “David Hammons: Five Decades” at Mnuchin Gallery. 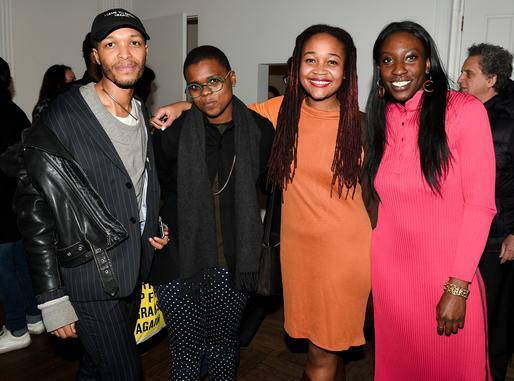 Each of the two shows cast its own spell, one very different from the other, but both seemed to offer one emphatic if understated lesson to young artists: Keep your distance from the art world. The whispers surrounding "David Hammons: Five Decades" were as important to the exhibition as the art itself. Accounts of the show tend to focus on how Hammons revisited the gallery on multiple occasions to contribute additional framed materials and reposition those artworks already included, and on how his last-minute changes to the show's installation meant the works featured in the catalogue did not match up with the works on view, as if the real story was about Hammons and his enigmatic ways. According to Mark Stryker of the Detroit Free Press, the Detroit Institute of Arts has launched a multimillion dollar campaign to collect African American art. 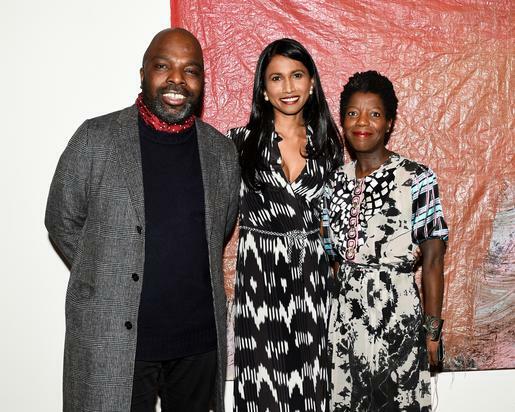 With this landmark initiative, the institution will strive to strengthen its commitment to African American art by also funding exhibitions, artist commissions, community partnerships, staff development, and internships. 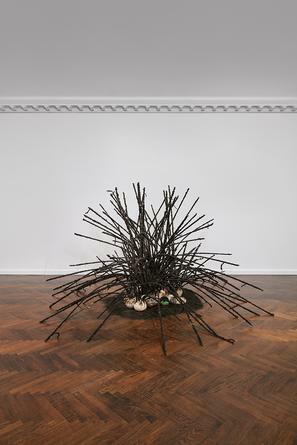 The Detroit Institute of Arts has acquired Bird, a 1990 sculpture by David Hammons, from the well-reviewed mini retrospective of his work at New York’s Mnuchin Gallery earlier this year. One day last week in the conservation lab at the Detroit Institute of Arts, director Salvador Salort-Pons gazed at the museum's latest acquisition and smiled as broadly as a kid who just found exactly what he wanted under the Christmas tree. In a small photograph included in “David Hammons: Five Decades,” the first authorized David Hammons retrospective in twenty-five years, the artist can be seen seated, chin in hand, exhibiting a composure that might lead one to overlook the fact that the elegant chair beneath him is missing its front legs. With his dark shades, crossed legs, and nonchalance toward his apparent balancing act, Hammons is the embodiment of cool contemplation. 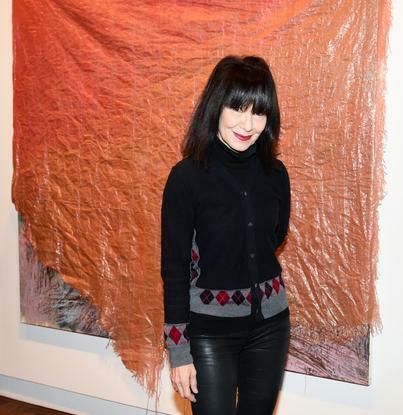 It was with the same poise that the rest of the work in this long-awaited, artist-conceived exhibition inhabited Mnuchin Gallery, filling two stories of the Upper East Side town house with a subtle menace and a set of social concerns that the neighborhood’s brass-handled doors and iron gates seem designed to keep out. 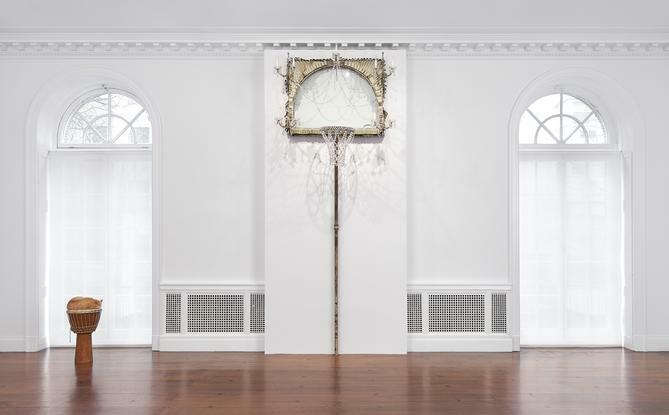 David Hammons is still an anomaly with a gift for turning social absurdities into witticism. Though he has abandoned the perverse (more on this to follow), I wondered what his retrospective, Five Decades—with its blatant ridicule of cultural stereotypes, capitalism, class-resource disparity, and art-world peculiarities—was doing at Mnuchin Gallery in the Upper East Side, a neighborhood that is around eighty percent white and statistically holds more Republicans than most places in Manhattan. Then again, he’s spent his five-decade career sarcastically taunting us with our own predictability. 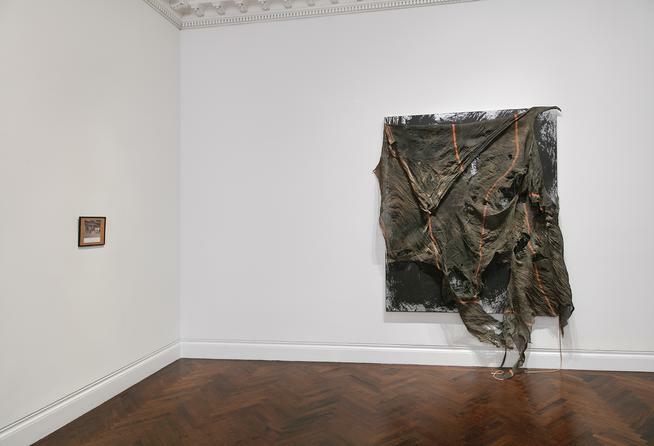 If you see one show this week before it closes, make it David Hammons’s five-decade retrospective at Mnuchin Gallery. You won’t find a clearly chronological setup or any didactic texts here; instead, you’ll find a highly conceptual, alternately cryptic and coy installation that’s charged with energy. Renowned for influential, idiosyncratic conceptual work addressing race and power in America, Illinois-born David Hammons is art's Greta Garbo, forgoing interviews and exhibiting rarely. That makes "Five Decades" an event. 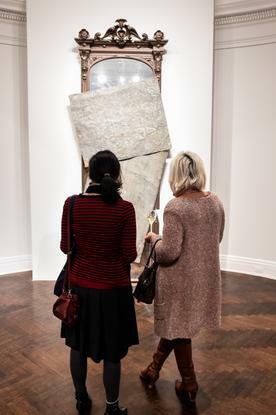 In this biting but elegant 33-piece retrospective set to Japanese court music, Hammons' gimlet eye transforms the gallery's white-walled East Side town house, pairing, among other things, a paint-splashed fur coat with a boarded- over mirror and redefining the meaning of art. Among the many brilliant and confounding works in David Hammons’s current retrospective is one entitled A Movable Object/A Japanese Garden (2012). The piece centers around a wheeled flatbed dolly, a perfectly banal machine bearing strange cargo: chunks of broken asphalt interspersed with unrecognizable articles of clothing and lengths of colorful tulle. Facing this apparent enigma, the mind grasps after established meanings. It registers familiar qualities like texture, color, and density. It tries to establish contrasts between the jagged opacity of the asphalt and the smooth translucency of the fabric. It asks questions: what is being said here about color, about blackness, about materiality or meaning? 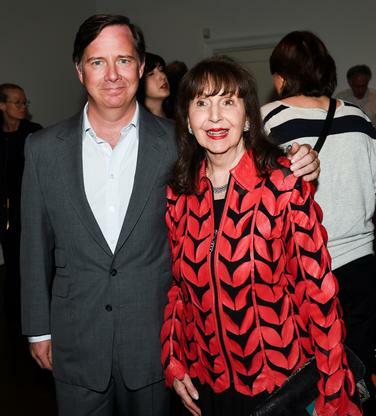 Upper East Side’s Mnuchin Gallery is hosting Five Decades, an ambitious museum level survey of David Hammon’s decades- spanning body of work. Nestled in one of the rustic townhouses of the upscale neighborhood, Hammons’ works on social justice, African American experience and freedom of expression blanket two spacious floors, promising a coherent portrayal of the Brooklyn- based artist’s profound work, accompanied by traditional Japanese court music chiming on the second floor. Rather than attempting to make visible those who might not be, David Hammons (b. 1943, US) explores the very nature of invisibility. His works threaten to disappear, whether by being situated out of reach, by hiding behind tarps, by dissolving into darkness, or by replacing concrete objects with abstract sounds. Raw, spiritual and always politically charged, Ham- mons’s work plays with art the way a jazz musician plays with sound — he gets inside it, bends it, twists it around and keeps it from sitting too still or getting too comfortable. Famous in part for absenting himself from the artworld, David Hammons creates work that addresses presence and invisibility, keeping him--or some shadow of who he may be- at its very centre. Concision is the word I'd use to describe the best work of David Hammons. Although he's often addressing the terrible complexities that come with being black in America, he does it with an incredible economy of means. In earlier years, the great David Hammons made work in the streets. "The art becomes just one of the objects that's in the path of your everyday existence," he said in an interview with art historian Kellie Jones in 1986. "It's what you move through, and it doesn't have seniority over anything else." Mnuchin Gallery’s new retrospective traces Hammons’ career back to its start in the late 1960s and includes never before seen photographs of key works and performances, sourced directly from the artist himself. In Mnuchin’s selective reprise, Mr. Hammons repeatedly demonstrates a wicked subversiveness that’s as sharp as one of those Miyabi knives that you don’t know has cut you until you see the blood on your hand. Almost all the 30-odd pieces in the show have some kind of sociopolitical charge, but a few are especially compelling and poetic. David Hammons has long kept his distance from the art world, legendarily declining exhibition offers from museums as if refusal itself were an artistic material. So this eloquently concise though nonchronological survey should incite the envy of curators everywhere. 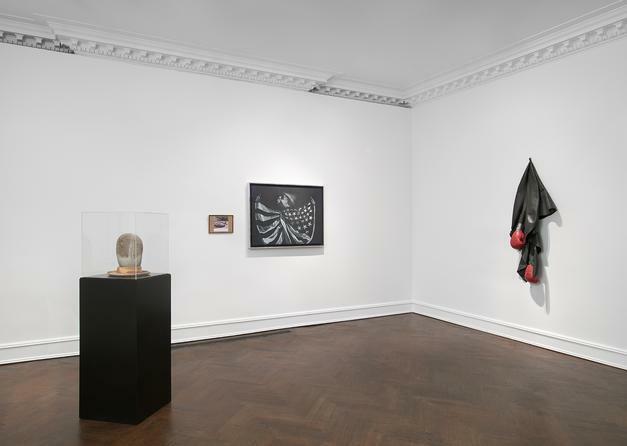 An exhibition of David Hammons’s work spanning five decades most generously features his modified readymades. Perhaps it’s because Mnuchin Gallery makes such an effective foil for them. “David Hammons: Five Decades," the first survey in 25 years for the elusive artist, has already received a great deal of acclaim. I've joined the chorus not only since this is one of the most visually and aesthetically striking exhibitions in town—a must-see—but because it also touches on hot-button socio-political issues that are as pertinent today as ever, especially as the country roils in the midst of a polarizing presidential election. 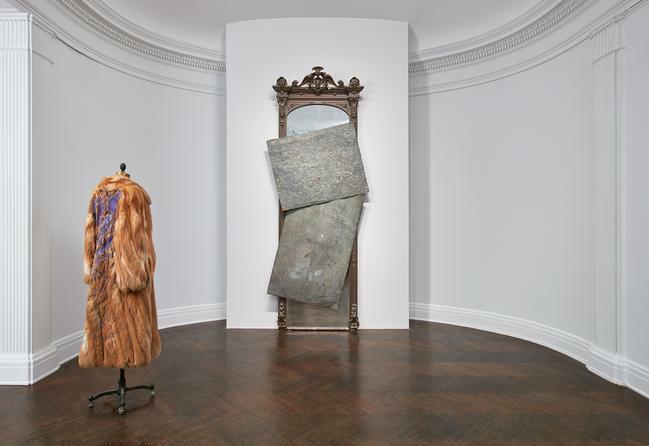 With David Hammons’s 50-year career being surveyed at New York’s Mnuchin Gallery, many critics have taken the opportunity to reflect on the artist’s work, which has often dealt with racial and economic inequities, both in the art world and in America as a whole. Below are excerpts from articles in the ARTnews archives, starting with Hammons’s early body prints from the late 1960s and ’70s, moving through an unauthorized retrospective at Triple Candie in 2006 and on to Hammons’s plans to set up a Yonkers space in the future. David Hammons is one of the most significant American artists of this century. From the beginning of his career in the late 1960s, Hammons was that outside voice whose creativity warranted a place among the art world’s somewhat snobbish inner circle. 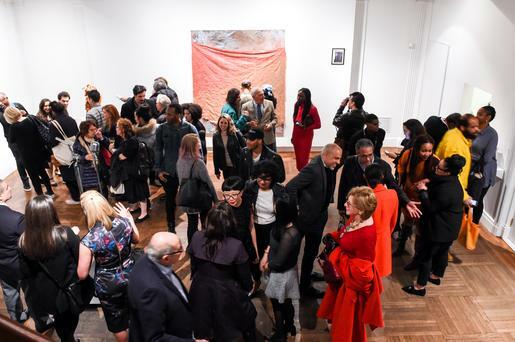 Sure, people would show up nearly anywhere for a show by David Hammons, the rare- appearing art genius whose work just gets more urgent as time goes on. 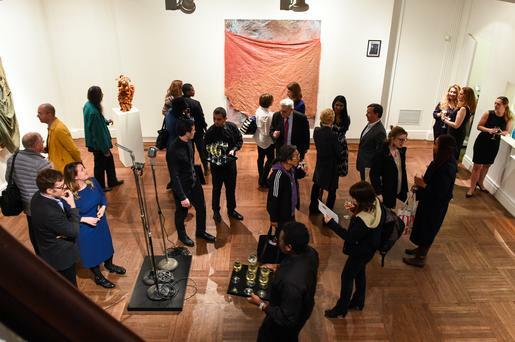 But there was something magical about his politically freighted survey of adjusted African totems, dribbled-basketball paintings, body prints, cat taxidermy, and beheaded hoodies (mordantly titled In the Hood) appearing at ex-Goldman Sachs banker Robert Mnuchin’s baronial townhouse on 78th Street. For five decades he has deployed conceptual jokes and everyday materials to reflect on the paradoxes and complexities of African American life. Although by no means exhaustive, this exhibition offers an important opportunity to survey the artist’s career, including his early “body print” Spade (Power for the Spade), 1969, and his sardonic riff on Minimalism, Untitled, 1989, a sculpture of fortified-wine bottles. 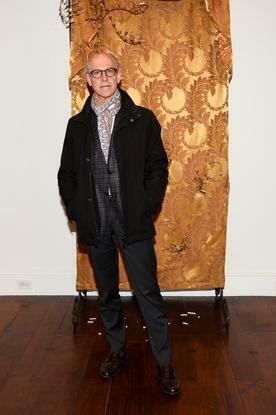 On the subject of the artist David Hammons, whose diverse work - from sculptures made with chicken bones and hair found in Harlem barbershops to a mural of a white Jesse Jackson - incisively address issues of race and power in American life, the New York art dealer Robert Mnuchin paraphrases Frank Sinatra: "He does it his way." Imagine an artist armed with Picasso’s ability to jump from style to style with ease, yet who injects each artwork with the political gravitas of a Guernica. Believe it or not, that artist actually exists and happens to still be alive. 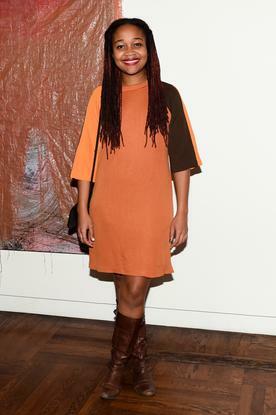 He’s also probably the closest thing our country has to a “voice” of black America in Contemporary art. 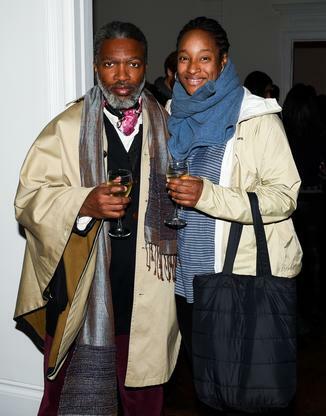 That artist is David Hammons, and you need to know his work. This concise retrospective—a sampler, really—is a big deal, as Hammons shows generally are. Now seventy-two, the artist has, by choice, exhibited rarely during the five decades of his now-you-see-him, mostly-you-don’t career. 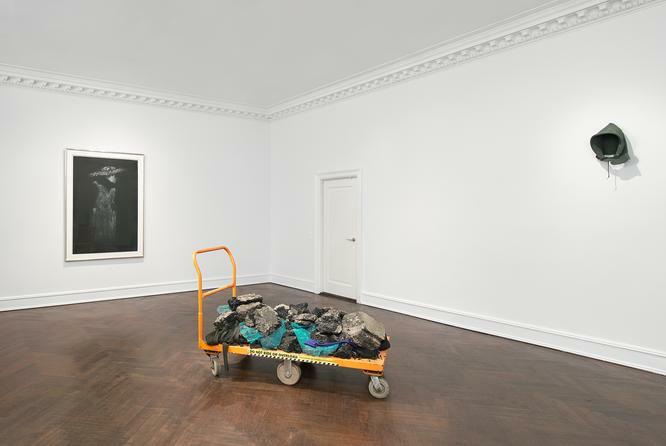 Mnuchin Gallery in New York opened its “David Hammons: Five Decades” earlier this month. Up through May 27, the show celebrates the artist’s works over the last 50 years. Many writers — including, most recently, Peter Schjeldahl in the venerable magazine The New Yorker — have characterized David Hammons as “elusive” and “difficult.” According to Schjeldahl: “The artist spoke with me, bracingly and delightfully, for a column in this magazine, in 2002. 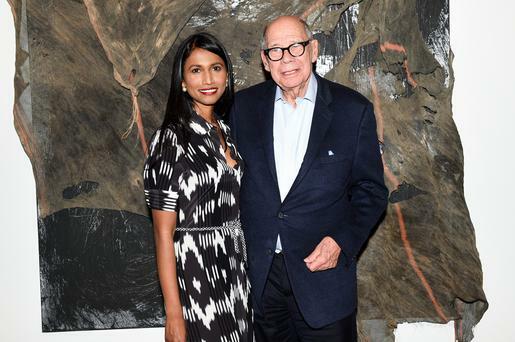 He wouldn’t do so again.” The ostensible reason for Schjeldahl’s rebuffed overture to the artist was the exhibition, David Hammons: Five Decades, at Mnuchin Gallery (March 15–May 27, 2016). “I can’t stand art actually. 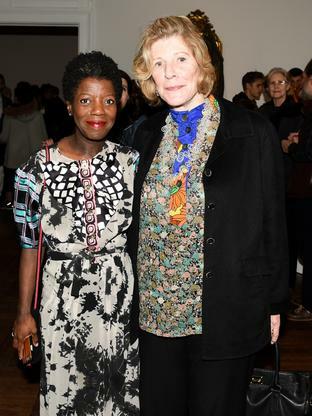 I’ve never, ever liked art.” So the artist David Hammons told the art historian Kellie Jones in a 1986 interview. Then why do you make it? Ms. Jones asked. 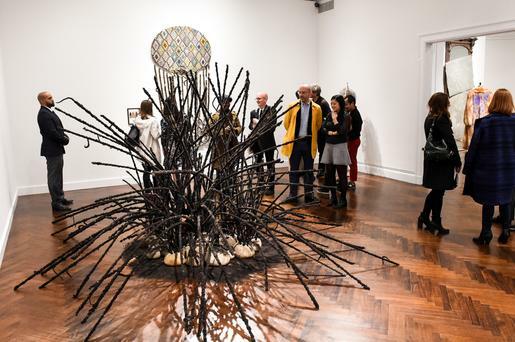 Because, Mr. Hammons offered, art is about symbols and “outrageously magical things happen when you mess around with a symbol.” Precisely such things are happening in the exhibition “David Hammons: Five Decades” at Mnuchin Gallery. Flying high outside the galleries of the Studio Museum in Harlem and overlooking 125th street is artist and perennial prankster David Hammons’s most famous work, Untitled (African American Flag), which reimages America’s flag in the Pan-African tri-color of red, green, and black. Whenever Hammons art is included in an exhibition, as the flag recently was at MoMA P.S. 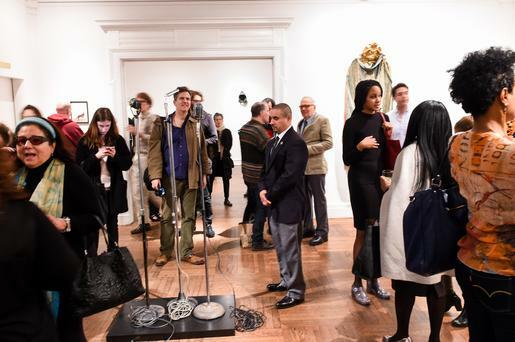 1 during “Greater New York,” viewers are offered anopportunity to renegotiate what can be art. This is the case again, in the recently opened solo exhibition, “David Hammons: Five Decades,” at the Mnuchin Gallery through May 27. 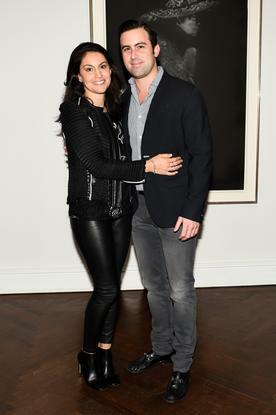 This is the third show of Hammons’s work presented by Mnuchin (formerly L&M Arts), and though much care has been taken to note that the gallery does not strictly represent the artist, it seems clear that Hammons finds satisfaction in the contrast of having his work — frequently made from lowbrow or dilapidated materials — showcased in the refined and august premises of the Upper East Side townhouse. This pocket retrospective illustrates the gritty, street-smart resonance of the artist's pointed work. 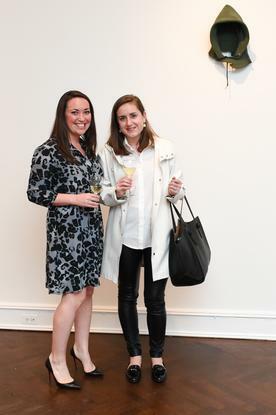 The New York art world elite was out in force at Mnuchin Gallery on Tuesday, March 15, for the opening of "David Hammons: Five Decades." 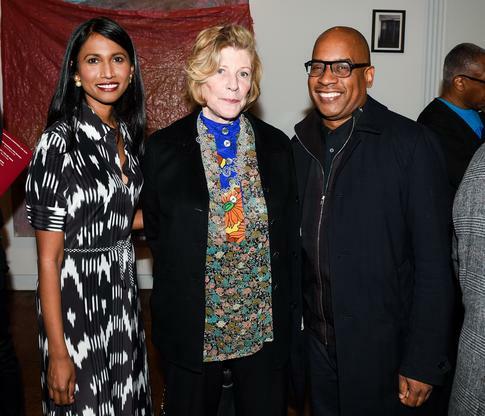 Given the museum-like scope of the exhibition, it was perhaps no surprise to see museum directors Thelma Golden (Studio Museum in Harlem), Glenn Lowry (Museum of Modern Art, New York), and Melissa Chiu (Hirshhorn Museum and Sculpture Garden, Washington, DC) were in attendance. 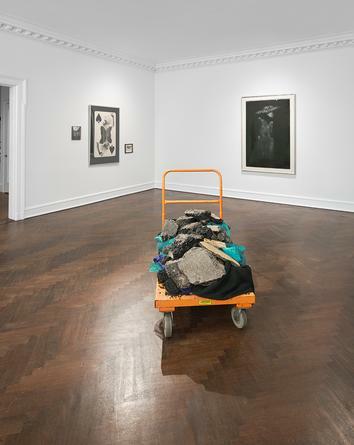 “It is an unfortunate fact that in this country,” the art historian Darby English has written, “a black artist’s work seldom serves as the basis of rigorous, object-based debate.” David Hammons, an elusive if highly generative artist who is the subject of this abridged retrospective at the Mnuchin Gallery, is a paradigmatic example of the phenomenon English describes. 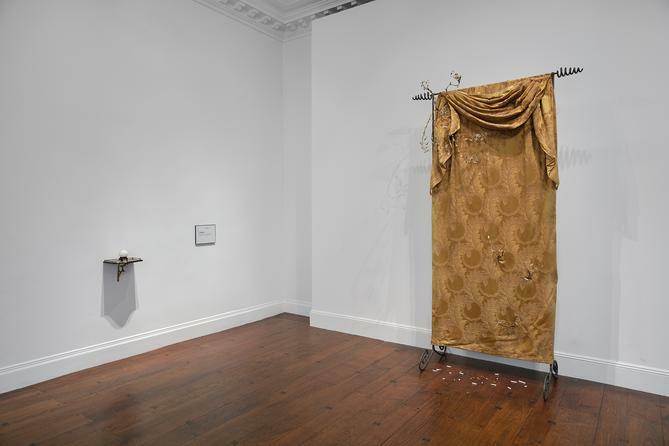 In its new career-overview survey, organized with the support of Hammons himself — no minor qualification, given the artist's history of evasion and difficulty — the Mnuchin Gallery attempts an outline of Hammons's fifty-year trajectory, from his beginnings in Sixties Los Angeles to the present day. The boon to an artist’s legacy that comes in the form of a museum retrospective can be multifarious. 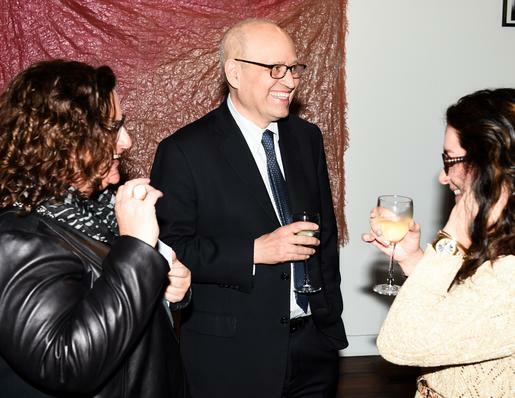 Not only do such events serve as accolades, underscoring a certain status reached in terms of the work’s critical reception and market value, they also bring a museum’s intellectual resources to bear on an artist’s career. In addition to the exhibition itself, catalogue essays help inscribe the work into the art-historical canon, contribute new research, and add to the archival record—ensuring future generations can discover and engage with the artist’s work. With David Hammons’s work, the recurrent idea might be that you can’t always get what you want. Hammons has, in the past, done all of the following: placed basketball hoops on telephone poles, covered mirrors in tattered shrouds, denied interviews with the press, made art out of elephant dung, and sold snowballs as a performance. And now that idea comes back with this show, a major survey of Hammons’s work, for which the artist, who has made art about the condition of African Americans in the U.S., has actually removed some of the more famous loans that appear in the catalogue (a portrait of Jesse Jackson as a white man is among the missing) and replaced them with various photographs from his collection. 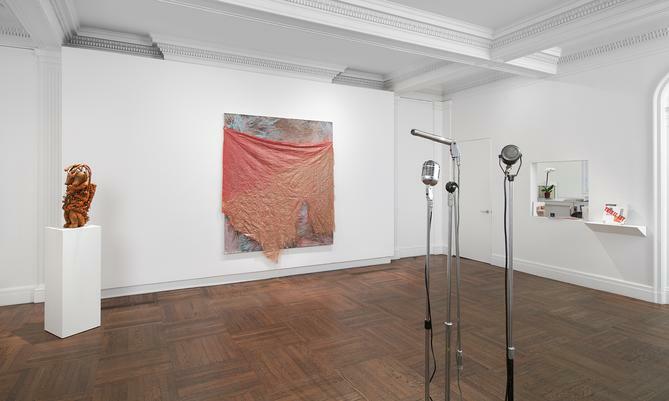 A concise retrospective—a sampler, really—of important works by David Hammons, at the Mnuchin Gallery, on East Seventy-eighth Street, is a big deal, as Hammons shows generally are. 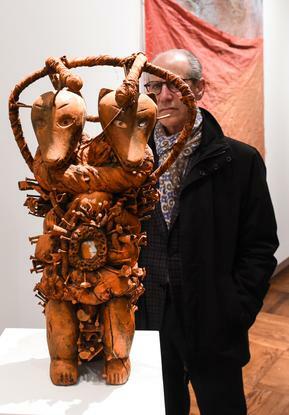 Now seventy-two, the African-American artist has, by choice, exhibited rarely during the five decades of his now-you-see-him, mostly-you-don’t career. A show opening next Tuesday at the tony Mnuchin Gallery, on Manhattan's Upper East Side, spans some fifty years of the artist's work, making it the kind of ambitious exhibition you might be more likely to see in a museum. The upscale setting is ironic, since Hammons's iconoclastic work often includes humble materials like rags, cigarette butts, and wine bottles. 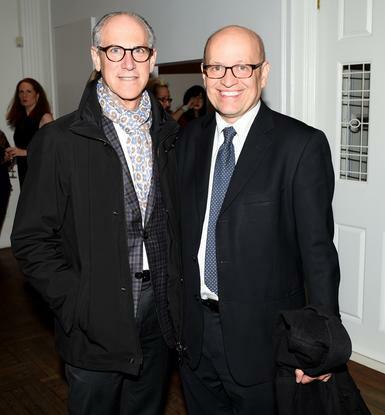 He collaborated with the gallery, something he seldom does, though he has in fact worked with Mnuchin on two previous shows. In honor of his upcoming retrospective “Five Decades” at New York’s Mnuchin Gallery (a rare event for the mysterious and officially gallery-less artist), we’ve excerpted this essay on Hammons's subtle, powerful installation piece Concerto in Black and Blue, written by the curator Bob Nickas and originally published in Phaidon’s Defining Contemporary Art. 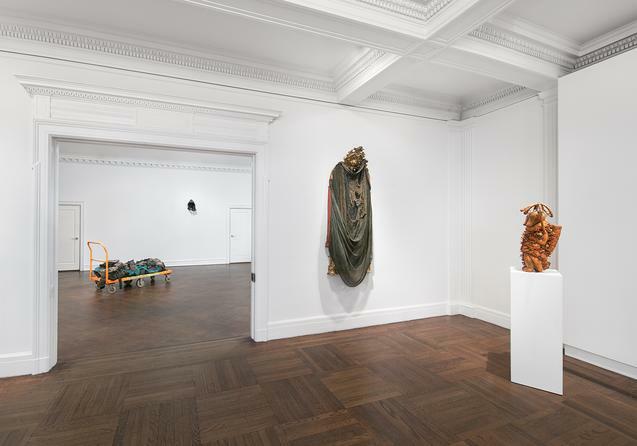 Formerly L&M Arts, the Upper East Side Mnuchin Gallery staged several solo exhibitions with the notoriously illusive and selective David Hammons before deciding to present this relatively small yet powerful retrospective – the first of its kind since MoMA PS1 mounted ‘Rousing the Rubble’ in 1990. For two decades, David Hammons's angle on survey shows could be précised by one of fellow Chouinard Art Institute alumnus Ed Ruscha's painted axioms: 'I don't want no retrospective' (sic). 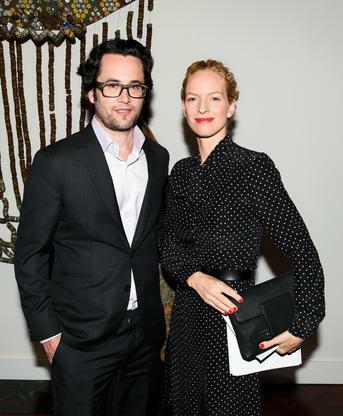 Also spurned by the Illinois-born, New York-based artist during much of that time: gallery representation, personality-driven publicity and a showy lifestyle, ie the trappings many artists appear to covet. 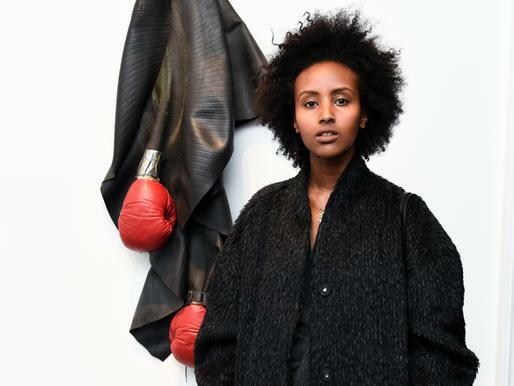 Not playing by art-world rules, not to mention declaring "the worst audience in the world", appears only to have increased David Hammons’s mystique and appeal. Fisun Güner appraises the long career of a master nonconformist ahead of a new show at Mnuchin Gallery. Major exhibitions throughout the United States and around the world feature the work of important African and African American artists this season. David Hammons is mounting a career survey in collaboration with Mnuchin Gallery in New York, the first such exhibition of the elusive artist’s work in two decades. 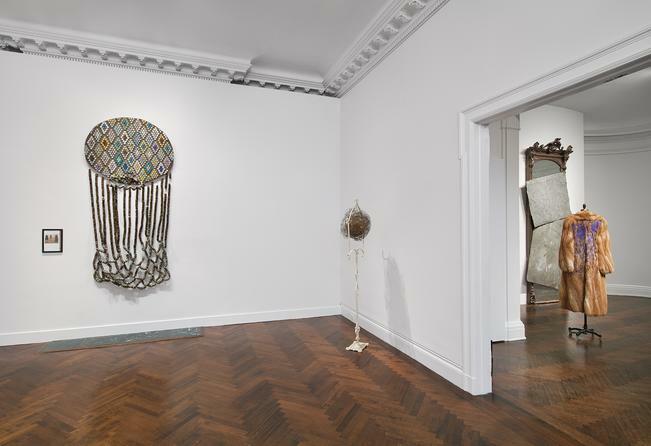 Just about every gallery and museum would like to have a David Hammons show. 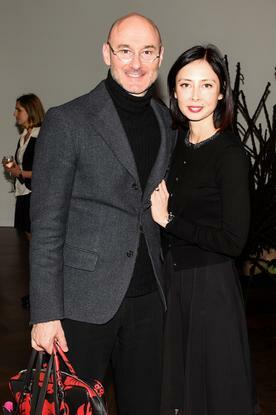 But that artist is famously particular and elusive. So the Mnuchin Gallery feels fortunate to be mounting a 50-year career survey of Mr. Hammons with his blessing. David Hammons is one of the most important American artists today, though you wouldn’t necessarily know it. An artist of his stature would have been recognized by now in major museum surveys, but as one of the first African-American artists to have emerged in the context of ’60s Conceptualism, he has always remained elusive and apart from the largely white art world as matter of strategy.